We are pleased to introduce the first 'All Day With', an event focused on providing a platform for international artists to showcase their talent without the usual 1 or 2 hour set time constraints. 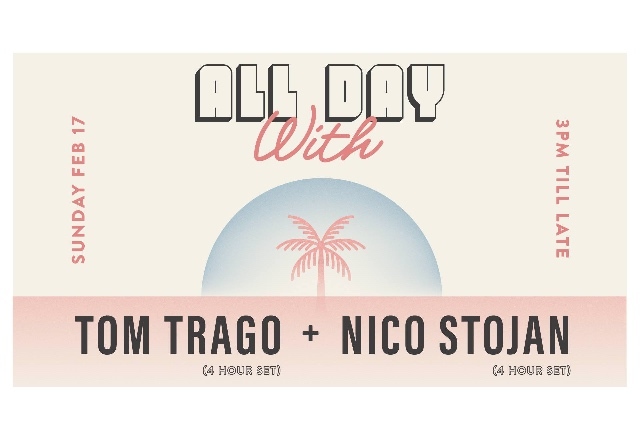 For our first edition we will be joined by Nico Stojan (Berlin) and Tom Trago who will both be playing 4 hours + at our rooftop Sunday day party. Berlin native Nico Stojan is an artist that has been taking people on musical journeys since the early nineties. He has the ability to blend both analogue and digital sounds with entrancing melodies and irresistible groove. This makes Nico the model artist to kickstart this new event. Our second international needs no further introduction.